The treatment of pneumonia varies according to the case. In mild case, generally caused by a virus, no treatment at all may be necessary. However, where the child's breathing is laboured and if his tongue looks bluer than normal, then oxygen will be needed. If part of the lungs has collapsed or if it sounds as thought the child has a great ideal of phlegm in his lungs, physiotherapy may be needed. Lobar pneumonia can be cured within two days with penicillin given by injection. The less clear-cut pneumonia's of infants and babies may or may not respond to against bacteria but not viruses. Many cases of pneumonia can be treated at home, especially it breathing is not inadequate. Whether or not a child is sent to hospital, however, depends on his age, the severity of the illness, the anxiety of the doctor, the reaction of the parents and the adequacy of their home for housing a sick child-particularly in terms of warmth, damp and overcrowding. Complete recovery is the rule. And if the course of the illness is uncomplicated there is usually no need for convalescence. Most children return to school in a fortnight. 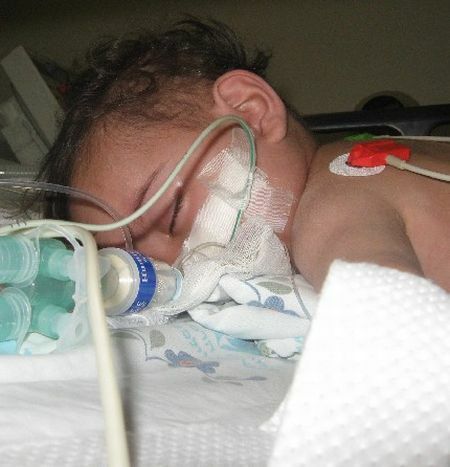 With the exception of the newborn, for whom pneumonia in the first week or two of life is a dangerous even requiring intensive care and possibly mechanical ventilation, an attack of pneumonia neither weakens the child of pneumonia neither weakens the child, nor, as a general rule, the lungs.